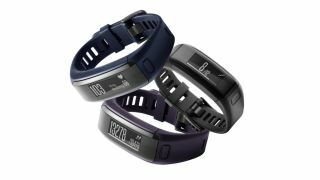 Garmin has updated their popular Vivosmart fitness tracker range with a new band that includes 24/7 heart rate monitoring, which should make monitoring your fitness more precise. "This is the first activity tracker from Garmin with Elevate wrist heart rate technology that monitors your heart rate 24/7, offering more feedback on your daily activity," said Dan Bartel, Garmin vice president of worldwide sales. The added heart rate sensor will allow users to measure their activity intensity, and match it against aerobic activity goals recommended by leading health organisations. As well as heart rate monitoring the band will also estimate calories burned, monitor sleep, measure steps, distance, and count the number of floors climbed with an integrated barometric altimeter. The Vivosmart has been released in conjunction with a new campaign called 'Beat Yesterday', which encourages people to do better than they did the day before. Just like the Apple Watch, the Garmin Vivosmart HR will also remind users to stand up if they've been sitting down for too long. The band features an always-on screen, it's waterproof to 30 metres, and should be good for around five days of battery life.